Randal has been asked to do many Christmas card illustrations over the years for Northwestern University. Most of them have featured one of their buildings with some kind of Christmas ornamentation added for the holiday spirit. 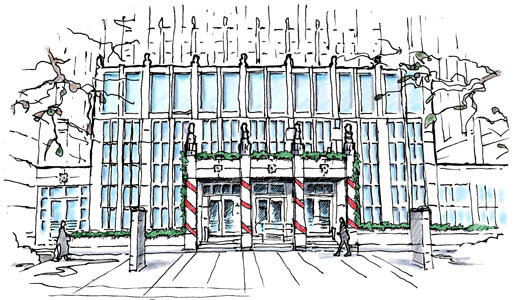 This illustration features the entrance to a building on the Chicago medical campus located at 300 E. Superior in Chicago, Illinois. It is a line drawing with watercolor and color pencil washes. It is a hybrid of hand-drawn line art scanned into a Mac and then touched up and tinted digitally with Corel Painter software.